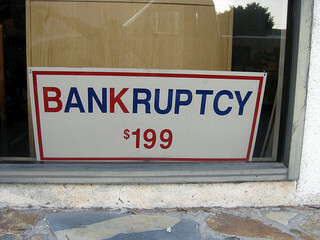 Beware the low-cost bankruptcy attorney! A cut-rate attorney will often bait and switch you or he will piece out or up charge you for certain services he performs that other attorneys include in their price. This means that they will get you in at a very low price and then raise the price later. Before you know it you are paying more for this attorney than for the one that had the all-inclusive price. Many of these attorneys will also often not be available to you as they pass you off to their underlings. Some of them may or may not show up at your 341 hearing and if they do you may not even know the person as your attorney because you have not ever met them. This means someone else has handled your bankruptcy petition, schedules, and all of your questions about the case prior to the hearing. If you call your low-cost attorney you will often not get a call back and if you do it will be from a paralegal or secretary or some other non-attorney office employee. It is hard to know who is making the decisions in these cases but I ask how can they be good ones? I often see these attorneys at hearings where they call out the name of the client because the client has never seen this attorney before. Do you really want to meet your attorney for the first time at a 341 hearing in front of the bankruptcy trustee where everything you say is on the record? I and many others believe that this is not good legal representation. You should be able to meet your attorney and speak to him or her numerous times before you even file you bankruptcy. By the time you get to the hearing you and your attorney should be well acquainted with each other and with your case. Meeting your attorney for the first time at the 341 hearing is a very bad idea I believe. But this and other things can and do happen with low-cost attorneys. You can see from the “Bankruptcy $199” sign above that there is no end to how low they will advertise their services just to get you in the door. When you sign up though you find out the real cost. I heard rumors of an attorney that allegedly charged $500 for a bankruptcy filing. For that price he had you fill out forms online and he filed the case for you without even meeting with you. I don’t know if he even showed up at the hearing. You do have rights as a Debtor though and in our district you should get a “rights and responsibilities” document supplied by your attorney which is filed with the case. This will tell you what you are entitled to expect from your attorney when he or she represents you in a bankruptcy. It covers such things as the attorney’s duty to advise you about all aspects of the case and his duty go to your 341 hearing. It also covers the attorney’s duty to meet with the client and explain such things as the various bankruptcy chapters and the attorney’s duty to return phone calls and meet with the client to handle their issues as they arise. All attorneys are required to do these things at least in our district. But I suspect that the low-cost attorneys cut corners and may not do many of these things. It costs a certain amount to run a law office and a cut-rate attorney must pay these bills just like a regular attorney. He or she must therefore provide less time and service to clients or take on a lot more clients than they can reasonably handle (or both). There is just no way around it so be wary of these bargain basement attorneys because as a client you could suffer greatly with a cut-rate attorney especially if an unforeseen problem arises in a case. Guy in suit courtesy of OCAL. $199 photo courtesy of Wallula Junction.